Looks like there will be more opportunities for kids to roleplay along with their favorite Forces of Destiny characters. I found a listing for a new “Force Crystal Lightsaber” via a foreign retailer. I’d expect it to start hitting retail sometime in the first quarter of 2018. 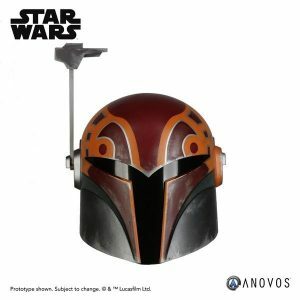 Anovos has updated today with details for their wearable Star Wars Rebels Sabine Wren Helmet Accessory. Click on over for pricing and preorder information. ANOVOS has teased via Facebook their upcoming preorder for their new Snowtrooper Ensemble. Preorders go live for newsletter subscribers on Christmas day. Get a behind-the-scenes look at Star Wars Costumes: The Original Trilogy in this special trailer where author Brandon Alinger received unprecedented access to the original costumes from Episodes IV-VI. 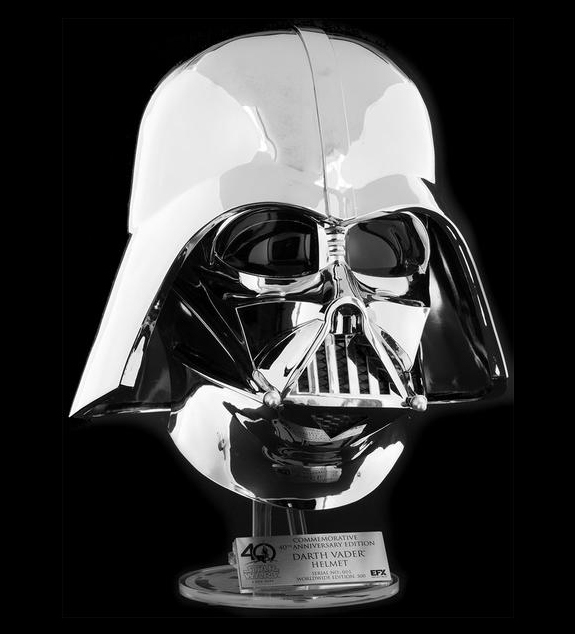 ANOVOS is now taking pre-orders for their Darth Vader Wearable Costume. Priced at a surprisingly low $2062.00 – 25% off for a limited time. StarWars.com today announces the all-new Darth Vader (TESB) Replica Costume from ANOVOS! Designed with costumers in mind, features include a self-aligning helmet (using magnets and keyed locking mechanisms), a built-in helmet ventilation system, reinforced shoulder bell hinges, and strategically placed ventilation mesh in both the Premier and Standard edition undersuits. ANOVOS has also maintained film-accurate details such as an asymmetrical mask, two-tone paint scheme, and 100 percent wool crepe cape. ANOVOS Productions LLC has announced an exclusive line of Star Wars costumes that will be available for pre-order starting on May the 4th. They are kicking things off with costumes from The Empire Strikes Back including Luke’s Bespin Outfit and Han Solo’s iconic look, with Darth Vader coming this summer. The line doesn’t stop there as they have a line of armor-based costumes in the works as well with everything from stormtroopers, biker scouts and sandtroopers to clones and Jango Fett. Head on over to CNET.com for the full article by Bonnie Burton. Look for images from the collection to premiere during the Chicago Comic & Entertainment Expo from April 25 to 27. Update: The 501st Legion has posted a first look of these costumes via their Facebook page. By now you have seen images of Adam Savage (Mythbusters) cosplaying at Admiral Ackbar for this year’s San Diego Comic-Con. Now you can watch and read just how he created (and perfected) this amazing disguise over at Tested.com. Also be sure to check out the video of him building Han’s infamous DL-44 blaster.